Artemis Fowl (Artemis Fowl, Book 1) by Eoin Colfer is a well-written, fun-filled fantasy for children. It tells the story of Artemis Fowl, a 12-year boy genius and anti-hero that sets out to outwit the race of fairies and steal their gold. Artemis Fowl is set on a family estate on the outskirts of modern day Dublin, Ireland. Artemis Fowl Senior, a wealthy Irish crime lord, wanted to go straight and gain respectability as a legitimate businessman. Unfortunately, he disappeared when his ship, the Fowl Star, sank in an attempt to deliver 250,000 cans of cola to Siberia. His wife, Angeline Fowl, went insane and moved into the manor's attic. His son, Artemis Fowl Junior, the book's hero and his father's sole heir is convinced that his father is still alive and spends all his time and almost all the family's fortune trying to find him. When the money began to run out, Artemis devised a plan to steal gold from the race of fairies living underground and known as "The People." His plan was simple. He would kidnap a fairy and hold it for ransom. Unfortunately for him and fortunately for the author and the reader, he did not count on the ingenuity of Holly Short, the fairy he kidnapped. Holly Short is a captain of the LEPrecon (Lower Elemental Police Reconnaissance) an elite force trained in dealing with the "Mud People" (humans). Julius Root, the commander of the LEPrecon, utilizes a unique group of resources to release Holly including, Foaly, a techie centaur, Mulch Diggums, "a kleptomaniac dwarf", and contrary to his wishes, a dimwitted troll. Artemis has on his side Butler, his trusted bodyguard, and Julie, Butler's sixteen-year old valley girl sister. Artemis has the fairies outwitted at every turn until he makes one devastating mistake. 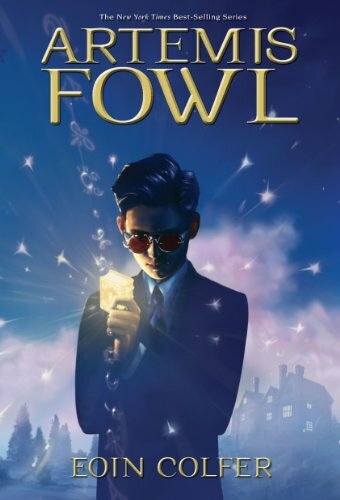 Artemis Fowl is riding on the popularity of Harry Potter, but is unique in its own way. First, Artemis Fowl is an anti-hero. He is the supposed villain in the series, yet while he is smug and obnoxiously spoilt rich kid, he is delightfully likable. Second, unlike Harry and his friends at Hogwart, Artemis is completely human. Although he is a genius and very, very rich one at that, he has only human skills for outwitting the fairy race. Finally, unlike Harry who has his teachers to pull him out of every sticky situations, Artemis has only his loyal human servants, Butler and Julie, to help him. Artemis must, in effect, not only save himself but also save them. Artemis Fowl (Artemis Fowl, Book 1) by Eoin Colfer is the First Book in the "Artemis Fowl series". The series is interesting, but not as challenging to read for a young reader or as daunting to lift as the Harry Potter series. The book is recommended for ages 10 years and up. I recommend this book.